We arrive at The Wild Horizons jetty to the mesmerising sound of African voices harmonising over water. A group of men, dressed in traditional skins are singing and dancing. The sound is beautiful as we make our way up the path and onto the jetty and boat. We are greeted by name and helped aboard where we are offered a glass of bubbly. The boat is a study in understated luxury. A open plan single-story it is decorated in tasteful neutrals, and has plush seating at intimate tables of four. My dining partner and I take a seat and begin to take in our surrounds. The Zambezi is beautiful. It stretches glass like in the evening light, with palm islands adorning it and the sounds of the singer’s voices carrying over the water. We take off, soon after being seated, and are given a short introduction and safety briefing by our captain, Jeremiah. It is immediately apparent we are in knowledgeable hands, as he orients us to our surrounds and points out many facts about the Zambezi. He is a calmly capable man, quietly answering all the guests’ queries with a smile. 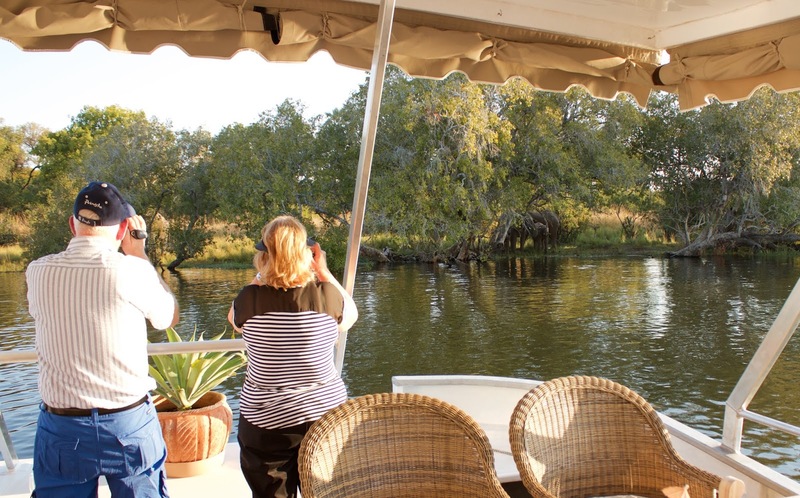 Guests Photograph a Crocodile on the Banks of the Zambezi. Image Sarah Kerr. The first of many well-portioned hors-d’oeuvres arrives as we bask in our surrounds and we are offered a drink from the cocktail menu. The food and beverages flow faultlessly throughout the cruise- the service is such that you never feel crowded yet also never find yourself wanting. Plate after plate of delicacies arrive- from crocodile croquettes to cheese selections, and you are free to order from the generous bar selection and cocktail menu. 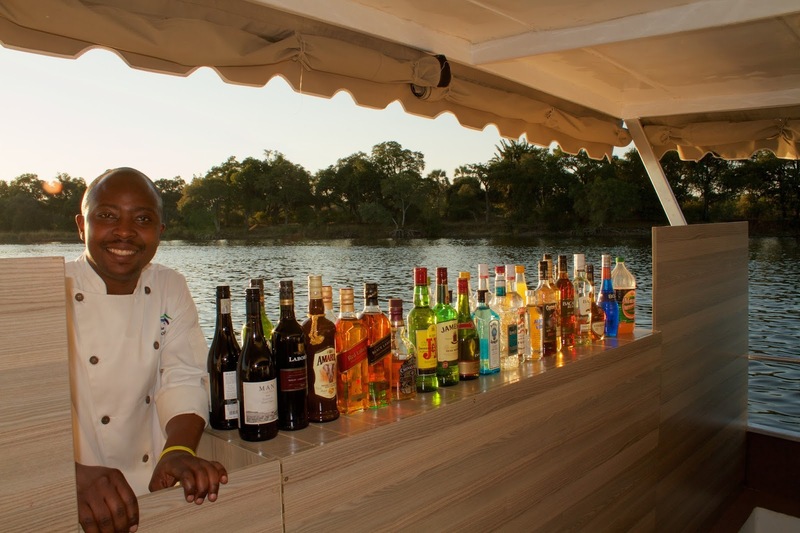 Friendly Service aboard the Zambezi Royal. Image Sarah Kerr. As we cruise upstream Jeremiah points out the many birds to be seen along the river and turns out be the outstanding feature of the cruise. As we glide along we see Open billed stork’s dextrously removing snails from their shell, White backed vultures swirling overhead, Cormorants and Darters preening, Egyptian Geese honking obnoxiously, the predatory swoop of the African Harrier-Hawk, the whistling of White-Faced Ducks and so much more. The boat is effortlessly steered for the best sightings and all of this adds to the background ambience and the feel of the river. We see larger creatures too. Hippopotami surface and crocodiles bask like oversized lizards on small islands, making for great photo opportunities. Then there is the special time we spend watching a family of elephants quietly come down to quench their thirst. They are unperturbed and we feel lucky to witness their interactions. Yet it is still the birds that most stand out; their abundance and variety is truly exceptional. As we make our way homeward, content and with sated bellies, Jeremiah mentions in his characteristically understand manner that there is an African fin foot up ahead and to our right. 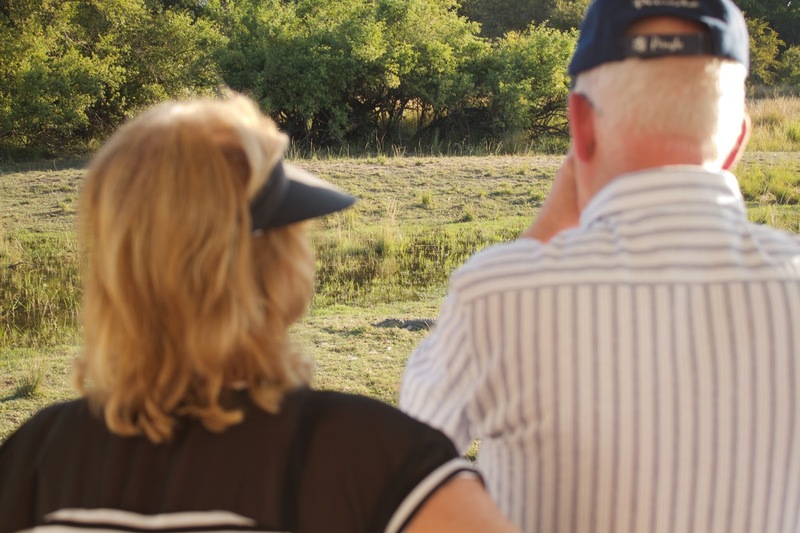 Watching a herd of Elephants from the Zambezi Royal. Image Sarah Kerr. You can hear the intake of breath by the two South African birders who accompany us. For them this bird is a ‘lifer’. A goal they have been seeking for years and never attained. 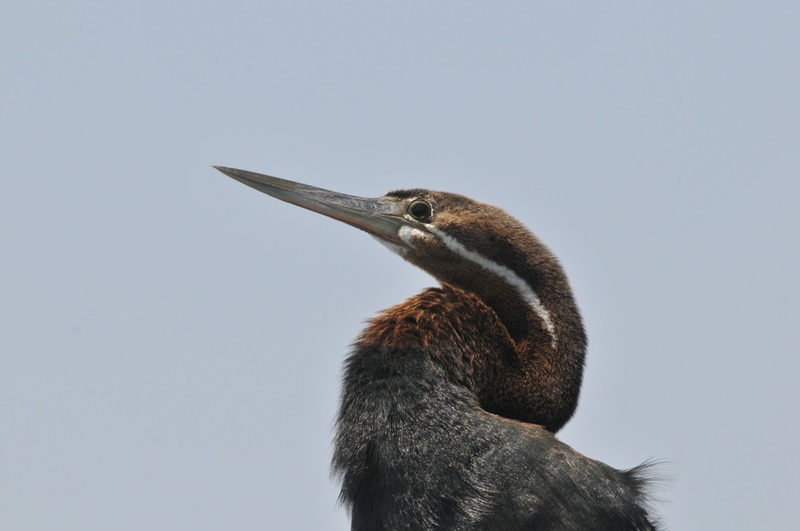 Because these birds are so highly secretive they are rarely seen by even experienced ornithologists and little is known about their habits or even their conservation status. We all peer unconvinced at the spot Jeremiah has pointed out to us. Where a tree’s branches reach the water in a confused tangle approximately 200 metres ahead. As he steers us closer we all squint and murmur ‘to the right’, ‘no, that’s not it’, ‘is that a log?’, ‘there’s nothing there!’… Until finally a gap in the foliage provides the glimpse we have been seeking. A small, pretty bird peers back at us before erupting from the tree and taking off downstream. This provides us with a beautiful view of the characteristic orange feet and bill and leaves us all with a sense of awe and gratitude. Our fellow passengers are beside themselves with joy and we make our way back with smiles on our faces, knowing we have seen something that few people ever get to. What we saw: Reed Cormorant, African Darter, Green-Backed Heron, Hamerkop, African Open- Billed Storks, Hadeda Ibises, White Faced ‘Whistling’ Ducks, Egyptian Geese, Spur Winged Geese, White backed Vultures, African Harrier Hawk (Gymnogene), African Fin Foot, African Jacana, African Wattled Lapwing, Pied Kingfisher, Giant Kingfisher, Brown-Hooded Kingfisher, White fronted Bee-Eaters and African Pied Wagtail.